On Sunday 11 June, the weather is forecast to be sunny. I organize a hike from La Haute Pointe (40 km from Geneva). Sightseeing and bucolic hike. The tour in the shape of rollercoaster allows us to observe several valleys. The route is little used before the step of Chavan. 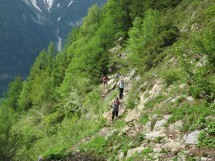 A gradient of 800 m and a distance of 12 km. Walking time: about 5 hours. Price 5 Euros including insurance. Transport: passenger pays 8 Euros to the driver.